I recently taught a cooking class for a bunch of lovely fellow food lovers, and during the class we made this delicious pear tart. It’s fabulously fragrant with spicy cinnamon, nutmeg and fresh ginger, and is really a cinch to pull together for a last-minute dessert. Not to mention, with some homemade vanilla whipped cream, it tastes like heaven on earth! It’s the season of pears, and while most of the year I forget how luscious and purely decadent pears are, I always remember around this time of year to pop a pear dessert in the oven and savor the sweet smell! The ideal pear is firm but fleshy, with a slight softness when handled. The riper the pear the sweeter it will be, so to ripen a hard pear simply leave it at room temperature until the neck of the pear yields to gently applied pressure – that’s a sign of ripeness and readiness to be baked with, cooked with or eaten as is! 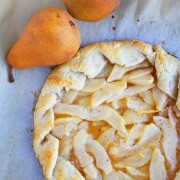 Try this simple pear tart for yourself sometime, and feel free to get creative with the fillings! You can also use strawberries, peaches and blueberries, or apples, just to name a few of my favorites. Either way, the result is a divinely delish dessert that is as fun to make as it is to enjoy with family and friends! Heat oven to 400° F. On a lightly floured surface, roll the pie dough into one 9-inch circle. Transfer to a parchment-lined baking sheet. In a large bowl, toss the pears, cornstarch, lemon juice, ginger, cinnamon, nutmeg, and 3 tablespoons sugar. Pour filling onto the pie crust, leaving a 2-inch border. Fold the edges of the crust over the fruit mixture. Brush the heavy cream on the crust and sprinkle with the remaining teaspoon of sugar. Bake until the crust is golden brown and the fruit is tender, 25 to 30 minutes. The more rustic the better. I also clicked through to the cooking class portal and came away with some great ideas. Thank you very much. Delicious! I love making tarts! They are so forgiving! A beautiful tart. Now why don’t we get together and make something soon? I’m thinking strawberry…maybe strawberry tartletts with some kind of delicious whipped cream? Let me know! It would be perfect for Valentine’s. Monet, I’d love to get together and bake sometime soon! I’ll send you an email. Your tart look delicious and beautiful in a lovely rustic way! There’s something so beautiful about rustic tarts! The crust for this tart looks as delicious as the pear filling. Rustic is so very appealing isn’t it? I love it. I have just printed your recipe – will get to this ASAP! Terrific! Would you change anything if using apples? The link to my apple tart recipe is in the post under “apples”, where you can see how the recipe might differ. Pears are one of my favorite fruits! I love the simplicity of this tart. Yum! Very pretty! I’m still a bit intimidated by having to fit a pie crust into a pan…but this rustic free-form tart looks like something I could do! I love everything with pear! So good! This sounds like such a tasty and simple dessert! Would even go well as a bite-sized breakfast on the go! 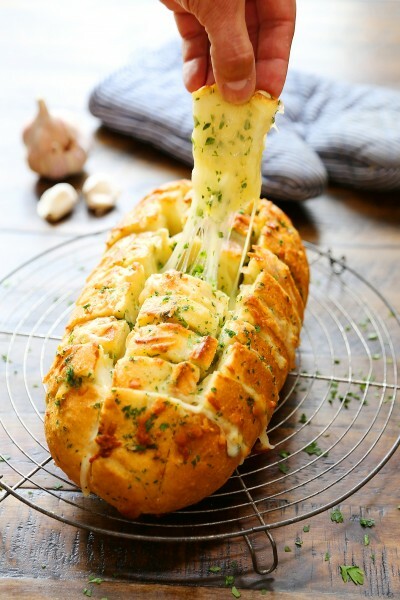 Our food lovers would LOVE this. We’d love if you’d check it out and contribute! http://bit.ly/yI0sZU Cheers! Beautiful, Georgia! Rustic galettes are among my favorite things to make. They come together in a snap and the options are endless. Yours looks sumptuous. Yum! My family has a pear tree in the backyard. This would be an excellent use of it! I adore rustic tarts, especially with pears or apples. Thanks so much for this recipe! This is a quick, delicious ending to a meal or a day for that matter. I have made it twice. The first time I added the lemon zest of a whole medium size lemon and 1/2 cup of raisins. I was also out of fresh ginger so added 1/2 tsp. dried ginger and upped the cinnamon and nutmeg a bit. The reviews in our house were, “Yum!! !” I just made it again and also added 1/3 cup of toasted pecans and upped all the spices to 1/2 tsp. each. Yep, we like things spicy! You will no longer ought to kind “.com” when entering inside a site’s deal with right into a internet browser. For example, you can kind “yahoo and google” in the Website url container, and you will definitely be redirected to “google.com.” You can even hit and contain the “.com” button to find out various options, including “.org”, “.edu”, and “.net”. Before getting a renter’s insurance plan, take a peek close to your flat and get pictures of what you wish to have taken care of if there seemed to be a failure. Calculate every single item’s really worth and locate an insurance policy that can include at least that amount within the case that you need to document an insurance claim. Even though you really feel hurried every morning or just usually do not think that finding the time to consume breakfast, stop and sit back and try to eat something healthy. It will enhance your metabolic process and add some fuel to the system for a day. Research has revealed that people who have your morning meal each day have more accomplishment in losing weight.